KANSAS CITY, Mo. (AP) — Mississippi State’s Vic Schaefer was in no hurry to talk about returning to the Final Four, instead spending the first few minutes on the dais quietly circling the highlights on the box score. “They’ve lived all year with a bulls-eye on their backs. That’s hard to do, y’all,” said Schaefer, who arrived at the postgame news conference with the net draped around his neck. They closed within 74-68 on Dean’s 3-pointer with 2:53 left, but they couldn’t get a stop on the defensive end. Instead, the Bruins and Bulldogs traded basket-for-basket down the stretch. The Bulldogs’ lead eventually reached 18 points midway through the third quarter before the Bruins, fueled by defense, began to nip away at it. 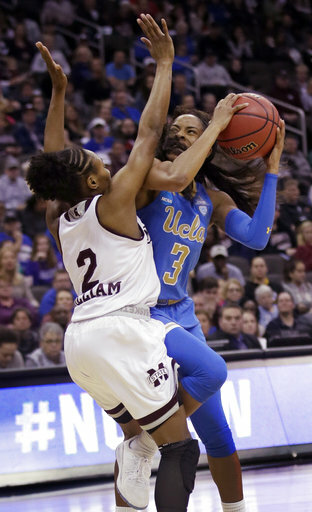 UCLA finally got it under 10 at 53-44 before Blair Schaefer hit a couple of deep 3-pointers to give Mississippi State another boost. UCLA made one final run, trimming a 67-52 deficit to 67-61 with 6:52 to go. But after the teams traded baskets, Schaefer knocked down her third 3 from the top of the key to silence the Bruins’ bench. UCLA needed someone to step up with Canada dealing with blanket defense, and they finally did when Dean and Billings fueled the Bruins’ late run. But the Bulldogs had enjoyed a comfortable lead most of the game, and they were perhaps a bit fresher down the stretch.